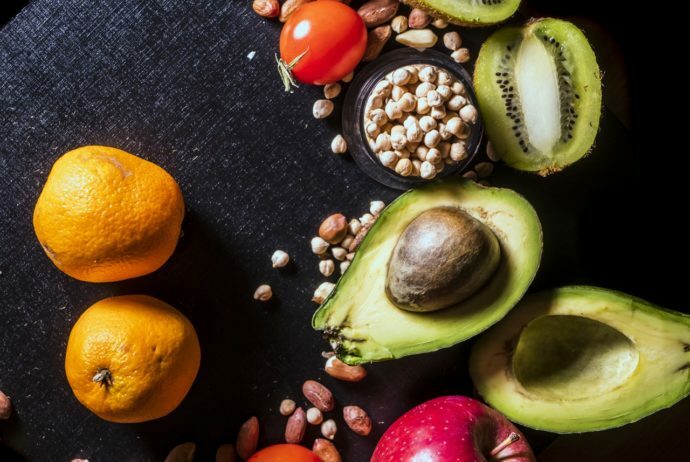 A regular listener to public radio, I was enthralled by this Freakonomics podcast all about food! It was so interesting to hear about each persons’ varying positions regarding local food and food politics and trends. It’s free; check it out! As I sit at the farm table munching on homegrown homemade veggies alone, I look over the landscape after a hard rain, listen to the bugs and frogs, see a cardinal atop a tree. After a short time of being out of the city, all my fears are replaced by gratitude. “I can’t believe I made it here. I am so lucky!” is all I keep thinking. “Here” being free, in Nature, work I love, debt free, few obligations or possessions to worry about. I keep reminding myself not to think about someday this or that, but that this is IT! Experience is the ultimate way to learn and I am so grateful I’m finally here. I feel as though I’ve discovered a treat in this way of living; like, why don’t more people live like this, away from so many of the stresses of the usual modern-day life? Above you see a very delicious homemade meal! 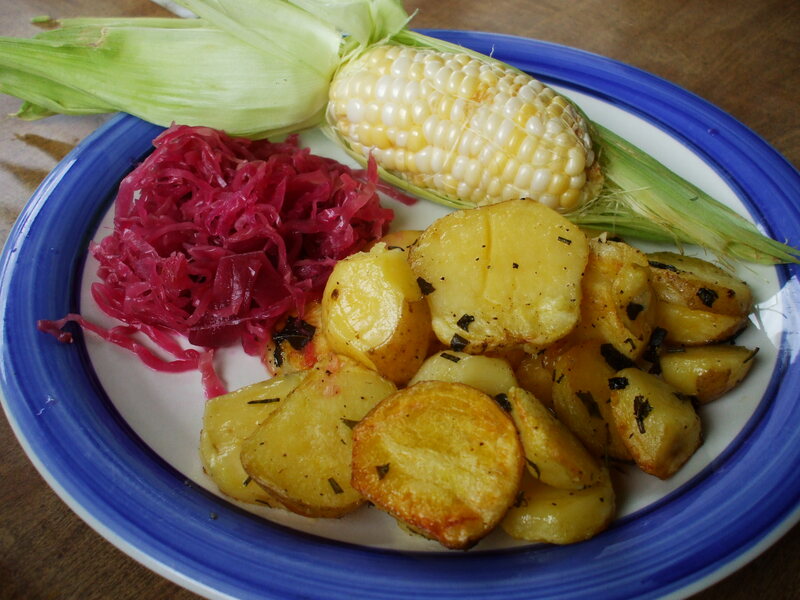 The potatoes were given to me by a neighbor farmer after I helped them with the farmers’ market last Sunday. I learned from him the reasons it is important to always buy organic potatoes. Potatoes are, after all, one of the dirty dozen. In short, throughout the process of growing potatoes conventionally, they are repeatedly sprayed with various toxic herbicides and pesticides. Check out this Organic Nation site to learn more about it. I’ve come to notice that farmers, at least the ones that I have met, are very generous people. They are proud of and want to share what they have grown. Unlike so many jobs today where workers see no physical result of their labor, farming provides almost minute-by-minute validation or challenge: new growth here, insect bites there, a huge magenta carrot pulled from damp soil, or the whole row of tomato trellising has fallen over. Unlike in many modern careers where the stresses are intangible, digital, or corporate, farmers experience directly with their subject matter, solving problems as they arise, planning on a more long-term basis, learning more season after season, year after year. I’ve noticed farmers are involved in their community’s politics, know their neighbors, and help each other. This is why it hurts me when people come by our farm stand and complain to me, basically a volunteer, that our prices are too high. I want to tell them – this is the real cost of food! I can’t claim to know all the ins and outs of our food system, but government subsidies, importation from countries who don’t pay employees a living wage (include the USA in that) falsely represent the cost of food. And the biggest hidden cost of conventional food to goes to Mother Earth. By abusing our planet, corporations can produce food for lower costs, but this practice will ultimately destroy us. I feel so lucky to be able to participate in this whirlwind of experience. I knew previously many of the reasons to buy and eat organic, but now having worked on at least one organic farm, I can say from that experience that organic is worth it and local is very worth it. Things are getting better and better. Except, I think I am going to go broke if I keep going to Native Sun, the health food store, twice a week. I need to go to the flea market on the weekends (even if it’s not organic, at least it is semi-local) then supplement that produce with Native Sun stuff. But as far as my cravings, much better. I don’t get as hungry at night and if I do, I can usually eat a small piece of raw fruit pie and then go to bed. 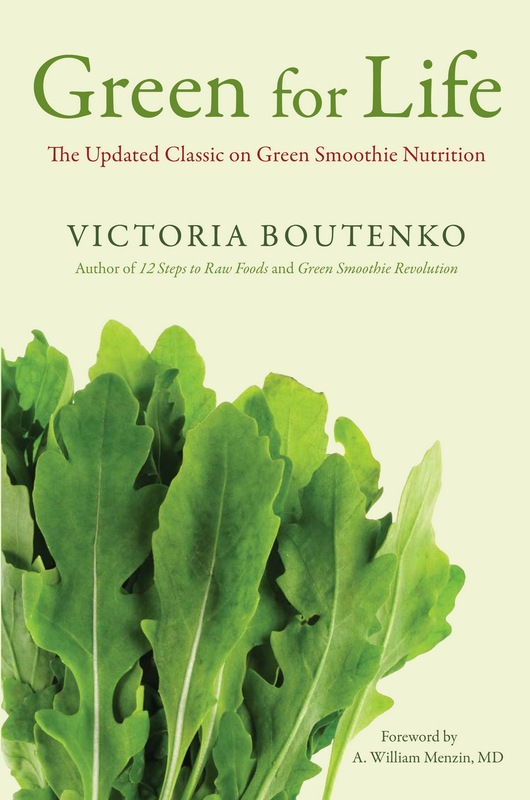 I figured out why I have been tired during this time for two reasons: 1) it was the week before my period, so of course I was going to be tired and 2) I read the section of 12 Steps to Raw Foods about detox and have many of the symptoms Victoria Boutenko describes (mouth sores, fever, weakness). I am now glad that I experienced these symptoms because she writes that if one does not, then it means their body is too weak to try to heal itself and get all of the toxins out. 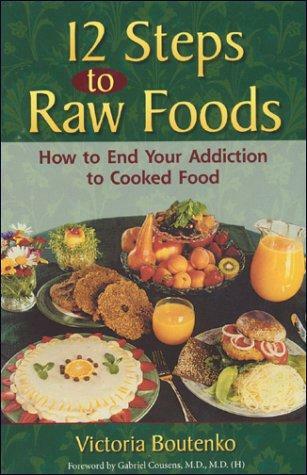 So, although I was feeling bad I am glad I stayed on raw foods because now I know it was just part of detox. I am glad I read the part about living harmoniously with cooked food eaters. Thanksgiving is coming up and I am apprehensive not about being tempted to eat cooked food, but about talking about eating raw foods to my family or explaining about it. Does anyone have any suggestions as to how to go about explaining raw foods in a simple, quick no-argument way? I don’t want to ruin Thanksgiving. Victoria’s suggestion is to say, “I am glad you are concerned about me, but I feel fine and you can eat what’s on your plate and I’ll have mine.” I think that is good. She also says not to pressure anyone in your family to go raw. Actually, she says to just put that out there up front. When you tell them you’re raw go ahead and say that you don’t expect anything but support from them and that they can continue to enjoy their turkey and stuffing. I need to do some patching. I told my dad I thought he might like to read Green for Life. I don’t want him to take my suggestion as pressure for him to go raw though. I guess I’ll bring it and let him look at it, but if he doesn’t seem interested, I’ll just let it go. I need to remember not to even ask them to try my food. But let them ask to try my food if they wish to. So here’s what it looks like is on the menu for my Thanksgiving: I think it’s going to be carrot pecan sunburger with candied yams and some kind of fruit pate. And of course salad, veggies, etc. I am just going to try to keep the peace with my family if they give me a hard time for eating raw foods.